I read this sonadow stroy it it's got me hooked for life. Anyway a scene from the stroy made it stand out to me, and I really wanted to draw it. So here it is. Here's a teaser from the stroy that goes with this pic. eyes glowed softly with fury. towered over him. He hissed. In a matter of seconds, it was frozen solid by his stare alone. love." He turned his gaze away from the frozen wave, and looked at his gloved hand, curling it into a fist. "Love has a high price, Shadow. Remember that." He smirked as his large wings loomed over his body, chuckling to himself with an insane glint in his eyes. He spread his wings and took flight, his quills ruffled by the harsh wind that blew against him. Little did Sonic and Shadow know, they were about to face the ultimate test of pure love. I am very proud of this pic cause it came out how I wanted it to, and I did the background by hand and I'm happy how it came out. Well I hope you guys really like it cause I don't want to feel I did will this effort for nothing. Stroy Copyright A Shadow in the Light. Ugh, I hate how so many people are so low about being gay, there is absolutely nothing wrong with it, in my opinion. 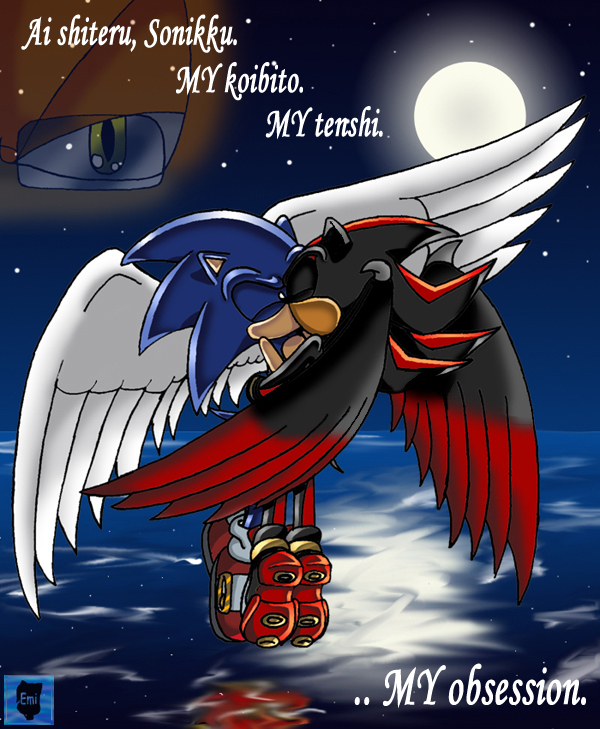 and Sonic kissing. :) Great work! WTF.. y do ppl keep makin sonic gay? when, in any of the games, did he hint that he was a big homo for shadow?.. sorry i dont mean to offend none of yall.. it is a cool pic but .. uh nvm.. I LOVE Shadow's wings Black and Red are my to favorite colors IN THE WORLD!